With increasing visibility for all educators to meet technology standards, teacher educators must prepare their teacher candidates for the increasing demand for education technology integration in preK-12 and higher education classrooms. Many university faculty, who are responsible for this preparation of teachers, feel unprepared for this challenge, which often pushes them out of their comfort zone. 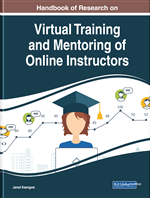 As teacher educators in a small university in Southern Texas, the authors explored specific engagements that serve as preparation of faculty for collaborative, online learning shared experiences and instructional strategy modeling that can enhance teacher candidates' self-regulation skills to integrate technology as they prepare to enter classrooms. As they develop and implement multiple engagements for use within their teacher preparation program, the authors maintain a growth mindset to help improve the quality of their technology interactions and continuously renew their efforts to promote the integration of technology. The underpinning of growth mindset (Dweck, 2006) posits that experience developing new skillsets can cultivate change, and as a theoretical framework this provides affective domain support for the delivery of required technology and professional standards for teacher education. In consideration of these technology standards, teacher educators are expected not only to adopt and implement educational technology in their practice, but also to promote and ensure that teacher candidates are prepared to adapt to evolving technology to support student agency in the technological focused classroom. This expectation for continuous adaptation causes stress among university faculty who are not familiar with the technology as a learner centered teaching strategy, but also to the teacher candidates who are learning to teach and may or may not see technology as a tool to enhance learning. A growth mindset encourages the passion for stretching yourself and sticking to it, even (or especially) when it’s not going well (Dweck, 2006). Effort-praised faculty and students maintain their faith in their abilities, keep on enjoying the task, and show markedly improved performance over time. The effort praise keeps them focused on what matters for their motivation and performance (Dweck, 2008). Through collaboration to define promising practices, both faculty and students can identify and incorporate Web 2.0 technologies, while recognizing that Web 3.0 is quickly approaching and seeing value in contributing to this new digital world. Approaching technology integration though microlearning allows the professional development of faculty and students to be situated in a way that is flexible learning that can be integrated into everyday activities supporting individual learning aims and goals (Buchem & Hamelmann, 2010). The didactic design of microlearning spans the boundary of formal and informal learning, and allows collaboration between each learner to access the skillset that will push their own development further, while developing self-regulated, lifelong learning capacities (Buchem & Hamelmann, 2010). The sociocultural impact of this type of professional development promotes learners who are willing to take risks and are interested in exploring and sharing discoveries with peers. Small interactions that lead to individual success provide a framework for greater successes and a willingness to explore alternatives to static pedagogical practices. Cross-Course: Planning and curriculum development across several sections of a course with multiple instructors or professors. HOTS Questions: Questions developed to engage higher-order thinking skills. Microlearning: Teaching content to learners in small, very specific bursts. Learning Management System (LMS): The digital platform from which a university or institution generally communicates. Personal Learning Environment: Tools, communities, and services that comprise individual educational platforms learners use to direct their own learning in pursuit of educational goals. PreK-12: Early childhood, usually 3-year-olds through 12th grade students.